Costa Rican resorts embrace its environment and community service. The Papagayo Peninsula initial development took shape in the early 1990s, just as Costa Rica was becoming established as the vanguard in a new type of travel: ecotourism. The government expropriated coastal land for use in tourism. 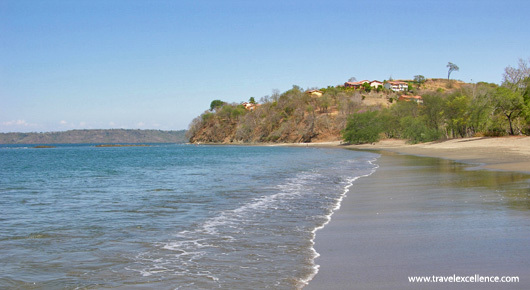 Papagayo´s master plan establishes strict environmental policies governing its development. The wide-ranging protocols included respect for the environment, adapting roads to the landscape, integrated management of water and public access to the beaches, as well as a community relations program. Nine resorts are planned for Papagayo, including three golf courses, a marina and 1,500 residential units. The 155-room Four Seasons resort and its Arnold Palmer-designed golf course were the first to debut, in 2004. As part of these environmental protocols, the Four Seasons resort preserve many mature trees, such as the banyan, ron-ron and Guanacaste, are now protected species and cannot be cut down. There are 380 ron-ron trees on the property, and every one is documented with a GPS location. Even if a tree falls down, they have to get permission from our environmental liaison to move it. To reduce the use of freshwater, up to 25 percent of the irrigation integrates seawater. Practices like these have enabled the course to be certified as an Audubon Cooperative Sanctuary. Ms. Elsa Bonilla (community relations manager) explains: The original concept for Papagayo was something people compared to Cancun, but we want for this to be a model for sustainable development for Costa Rica and all of Central America. The donations from Four Seasons and its guests to the Growing Together program (which is the community relations project) have helped support 16,000 people spread among 19 communities. Two years ago Bonilla suggested offering Four Seasons’ guests an opportunity at hands-on involvement. Since then, guests have helped paint six local schools, planted community gardens and donated funds to open a clinic. The resort’s website details the volunteer program and invites guests to bring a backpack stuffed with books and school supplies. In 2010, donations from Four Seasons guests totaled over $65,000. Bonilla said They write to me afterwards and say this experience was the highlight of their visit.